Another calm day as the market rallied modestly following the Fed’s policy statement and continued Taper. 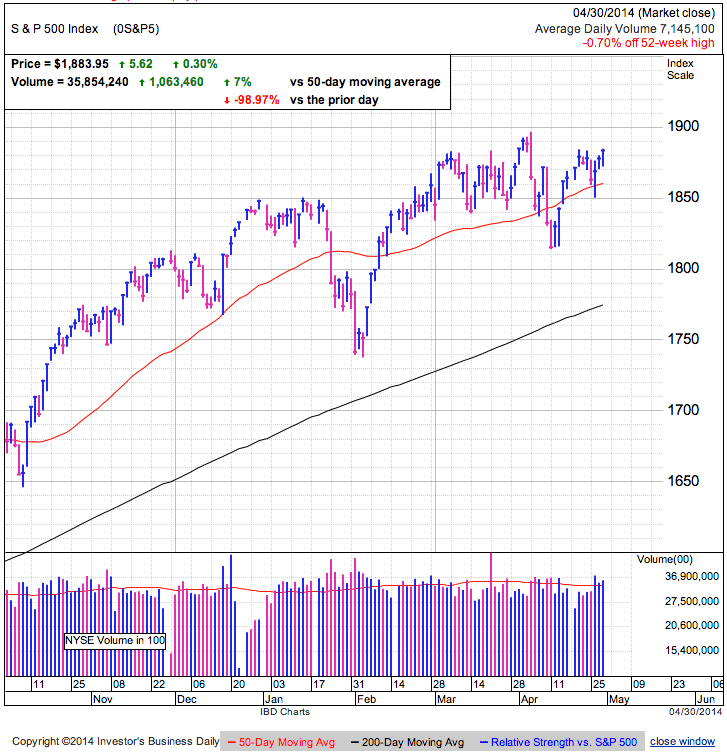 Volume was above average and continues the streak of elevated trade following Monday’s rebound. Stocks shrugged off shockingly slow first quarter growth before the bell and took the afternoon’s continued Taper in stride. This further reinforces the notion that anyone who would have sold negative headlines is already out of the market. Those left either held through Ukrainian drama and economic uncertainty, or bought the dip in the face of it. These owners showed a willingness to hold risk and that confidence kept them from hitting the sell button today. 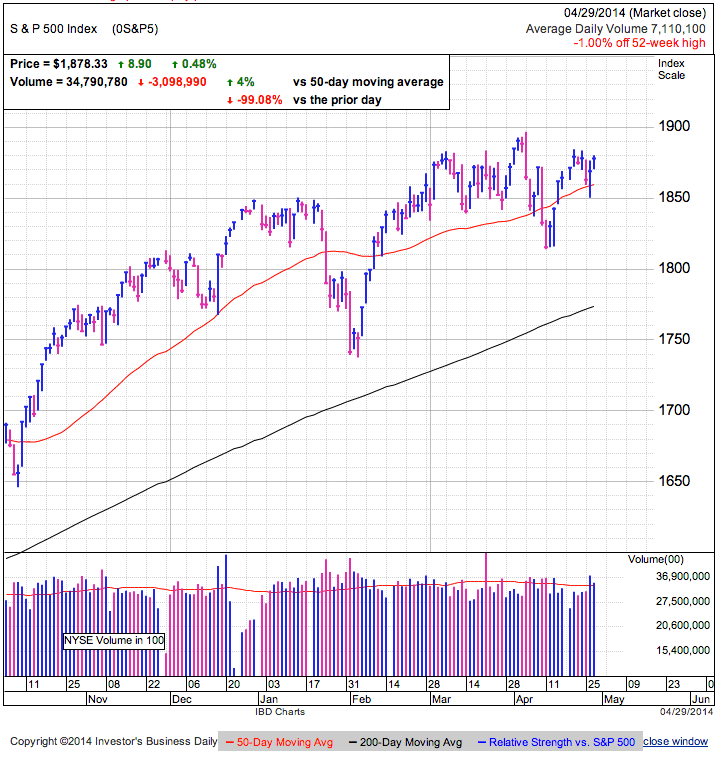 If they didn’t succumb to a dip under the 50-dma Monday or 0.1% growth Wednesday, they will likely be hard to shake free regardless of what the market throws at them and the resulting tight supply props up prices. High-fliers have been hit hard in recent weeks, but blue chip stocks held the larger market near record highs. Unsustainable markets, like the dot-com bubble, often see people dump safe stocks to chase speculation. In this situation, we have the opposite. Traders are fleeing obnoxious valuations and embracing consistent performers. That is rational behavior, not a prelude to a crash. Expected Outcome: Coasting higher on the back of short covering. The S&P500 is one point from breaking near-term resistance at 1,885 and that will send some bears running for cover. The rest will be flushed out when we break 1,900 for the first time in history. But after shorts and breakout buyers finish buying this strength, the market will likely stall as follow-on buying fails to materialize. We’ve struggled to extend last year’s rally and the summer doldrums are often a poor time to find support from big institutions. Most likely the “buy weakness, sell strength” trade will remain the best trade through the summer. Recent volatility cleared a lot of weak holders from the market, building the foundation for the next move higher. Sometimes we need 6 months of consolidation, other times less. If the market holds 1,900 following a breakout to new highs, this market could defy conventional wisdom and have a strong summer season. Dip buyers should already be in and bears are better served waiting for a better entry point. Long-term investors should continue holding, but wait for better prices to add to their favorite positions. Volatility virtually disappeared on a calm climb 0.5% higher Tuesday, a welcome break following Monday’s 60-point whipsaw. There was a little movement in the first couple hours, but after that the market settled into a couple of point range just under 1,880. This level morphed into a ceiling we bumped into several times and were unable to break through. Everyone who wanted to sell already sold and the lack of reactive trading allowed the market to calm down climb higher without much fuss. 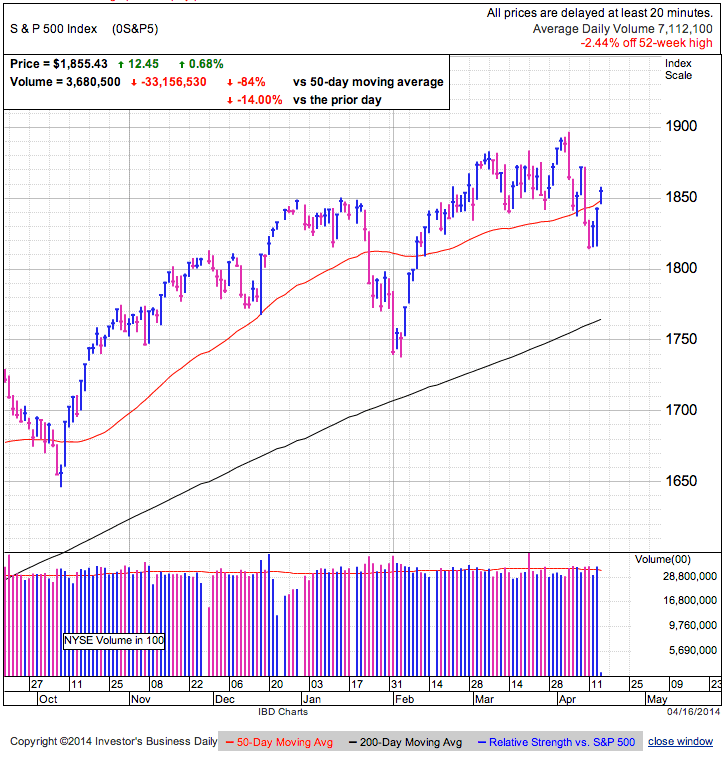 There is a finite supply of owners that can be spooked out by gloomy headlines and near-term volatility, and it seems we reached our limit when Monday’s price-action undercut recent technical levels. That was the signal for the last of the hopeful holdouts to cut bait and once they finished selling, the market rebounded on the absence of selling. Reacting to pain often flushes traders out at the exact wrong time and that appears to be the case for anyone who sold the dip under 1,860. While we ran out of sellers, the next question becomes, who will buy this rebound? The near-term answer is shorts getting squeezed, momentum traders, and breakout buyers will provide lift to 1,900, but after that it is harder to identify the incremental buyer. In prior tests of record highs, demand dried up and we stumbled lower. Are buyers finally ready to embrace these fundamentals and political headlines? I’m not so sure this is the start of the next rally leg. More likely the sideways trade will continue until big money managers return from summer vacation this fall. Expected Outcome: Challenge recent highs, but struggle to find new buyers needed to sustain the move. While recent predictions of a 20% correction appear premature, not bad doesn’t automatically mean good. We saw large gains last year and it is perfectly reasonable to trade sideways for an extended period. Barring some headline catastrophe, the summer will probably be relatively uneventful as we continue trading between the 1,800ish/1,900ish levels. The market chopped around since the start of the year and that goes a long way to consolidating last year’s gains. Fear and respect for the market has returned to relatively healthy levels and those contribute to building a foundation for the next move higher. While that move might come this fall, it could also be here earlier than anyone expects. Buy weakness and sell strength. The best time to buy this market was when everyone was scared, not as it breathes a sigh of relief. As we push toward the highs, this is a better place to contemplate taking profits than initiating new positions. While we likely have more upside, use a trailing stop to protect recent profits. Bears need to wait a little longer before challenging this rebound. It was a volatile but productive day. Stocks surged higher in early trade, imploded and sliced through support, and rebounded back into the green by the close. The volatility saw us move more than 60-points intraday and trading volume was the most enthusiastic we’ve seen in some time. If someone was bored Monday, clearly they were not paying attention. The price action was as dramatic as it gets and left both bulls and bears bloodied. It seduced dip buyers with early strength, crushed their soul with a 30-point collapse, built up the hopes of the bears before smashing them to pieces with a late day rally back into the green. While it was tough to be optimistic midday, the strong close on high volume was as bullish of a sign as it gets. The best capitulation bottoms undercut recent support, sending optimists scrambling for cover. This surge of selling eventually exhausts supply and we bounce higher when shares become scarce. That was exactly what happened today and likely means 1,900 is easily within reach. Today’s move was as bullish as it gets. We flushed out weak owners and replaced them with confident buyers willing to own this weakness. If anyone could hold this volatility and fear, there is little that will scare them and they are in it for the long haul. When the majority of the market becomes uninterested in selling, supply tightens and prices head higher. While it is hard to be bearish given how the market traded today, failing to build on these gains will be a huge warning flag. Undercutting 1,850 over the next couple days means the lows in mid-April are in jeopardy. We’ve been given the green light to go higher, but if the market cannot rally following this textbook capitulation bottom, then plenty of downside remains. The selloff is over and shorts should cover if they haven’t already. Swing traders can hold on for a test of old highs, but I’m still not convinced this move will lead to another large rally leg. Instead, expect the sideways trade to continue into the Fall and take profits early and often. Stocks sliced through 1,870 support and tumbled all the way to the low 1,760s by midday. 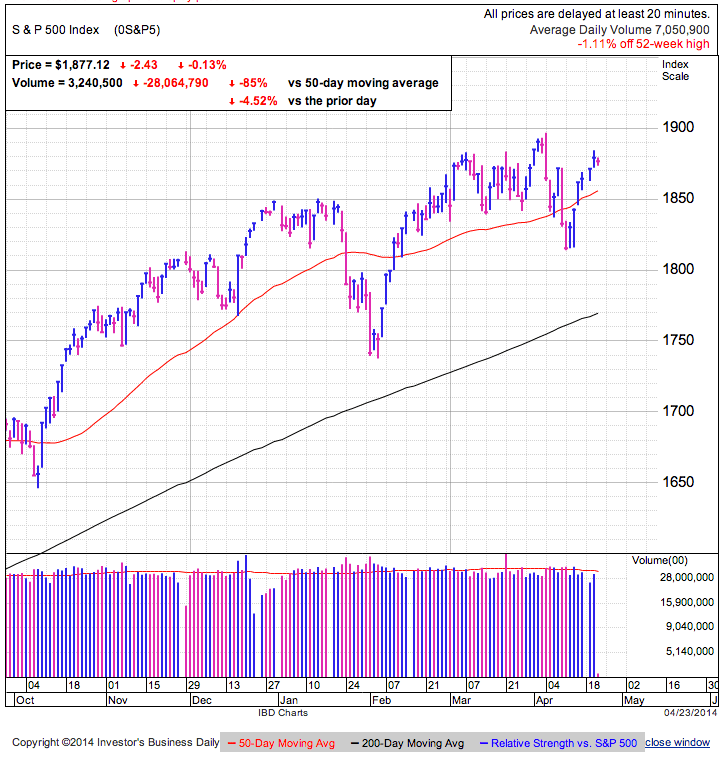 The market is still above the 50dma, but this level is in danger if the selling keeps up. The media claims this weakness is due to tensions in Ukraine and disappointing earnings out of AMZN and F. I guess that excuse is as good as any, but for all the anxiety this weakness is causing, we have only given up 20-points of a 70-point rebound. When taken in that context, this move appears more normal and healthy than scary. The more closely a person follows their positions, the bigger deal these gyrations appear. For the vast majority of 401k investors, a 15-point decline doesn’t even register, but for the guy who follows tick-by-tick, this is a huge move. If we pullback from the 5-minute chart and look at the daily, today’s “plunge” hardly shows up. But markets function by convincing people to overreact. Every dip feels like the start of a larger selloff because if it didn’t, no one would sell, and without selling we wouldn’t have the dip. Sometimes markets under appreciate the risk involved. This happened during the financial crisis when no one had a clue about the huge house of cards Wall Street built. Is that happening with the Ukrainian crisis? We’ve known about this unfolding event for a couple of months and the market largely brushed it off. Was it being naive? Are things deteriorating? Last time we went through this, Russian troops invaded Crimea and the market actually rallied. Now we have Russian troops amassing outside eastern Ukraine. Is this significantly worse than last time, or is it more of the same? If we learned anything from the first round, it’s that Europe needs Russia, and Russia needs Europe. Most of the words exchanged are little more than political grandstanding and it is highly unlikely we’ll see meaningful sanctions put on Russian energy exports or Russia withholding energy from Europe. The threat of a civil war is escalating, but the market’s proven time and time again over the years that revolutions and civil wars are not a big deal even when they involve oil exporting countries. For the most part, this Ukraine story is recycled news and anyone who owns the market here either held through the Crimea crisis, or they bought during it. Anyone afraid of these kind of headlines sold months ago. The main thrust of this mornings weakness is to punish late dip buyers. While it felt safe to buy after four or five up-days, today’s price action is proving otherwise. Expected Outcome: Rebound to the upper end of the trading range. Today’s weakness is cathartic for the market and clearing the way for a move higher. The fearful and pessimistic are selling to the confident and opportunistic. The fewer weak owners we have in the market, the more likely it will rally simply because we run out of sellers. Confident dip-buyers willing to hold through weakness makes it less likely we will encounter that weakness simply because there are fewer people willing to sell. Tight supply almost always equals strong prices. While this weakness could go a little further before it is done, selling off on recycled headlines is typically far more shallow than if the market was blindsided by something new and unexpected. Markets go up and markets go down. If anyone could figure out why, they would be extraordinarily rich. Sometimes they behave as they should, other times they do the opposite of what we expect. Last time we rallied on the takeover of Crimea, maybe this time we crash on the takeover of eastern Ukraine. This game would be too easy if the market were predictable. Buying on the fifth consecutive up-day, when everyone felt good, didn’t turn out to be such a good idea and selling here when everyone is freaked out probably isn’t the right move either. The trade of the year has been buying weakness and selling strength and that pattern likely remains intact. Maybe we haven’t found the bottom of this move yet, but it is safer to buy todays weakness than it was after a six-day rally pushed us up to 1,885. Stocks are down fractionally in midday trade. So far the market is holding 1,875, but struggling with former resistance at 1,880 that stretches back to early March. The bears identified a mountain of reasons this market should breakdown, but instead it holds within 1% of all-time highs. There are times the market does what we think it should, and there are times we are wrong. When the market doesn’t behave as expected, it means our analysis is flawed and there is something big we overlooked. This morning bears are pounding the table over Ukrainian tensions, earnings, weakness in momentum stocks, head-and-shoulders tops, low-volume up-days, among many other things. So why isn’t the market cracking wide open? The short answer is supply and demand. Most of the problems bears are promoting have been around for a while. Anyone who fears these issues already sold in the dip to 1,815. That means everyone left holding isn’t worried about these fears and they are priced in. While there are scary things abound, we cannot forget markets only move on supply and demand. When everyone already sold these headlines, there is no one left to sell and the market firms up on the resulting tight supply. But supply is only half the equation. For this strength to continue, we need fresh demand. The last time we were at these levels, buyers refused to step up and is why we slipped to the low 1,800s. Will this time be any different? The most obvious near-term buyers are shorts, momentum chasers, and breakout buyers. All three of these groups react to prices moves, not underlying fundamentals. The higher we go, the more these guys buy the market. Until we clear old highs, expect these traders to keep buying this strength. Expected Outcome: Pushing toward the upper end of a trading range. Bears might be right. This could simply be a false bottom and we have a date with the 200-dma in May. While I’m not a big believer in “Sell in May”, it only matters what other people think. If they start selling head of summer vacation, that will push us lower. Once we break recent lows, people start selling for no other reason than everyone else is selling and we continue lower in a downward spiral. 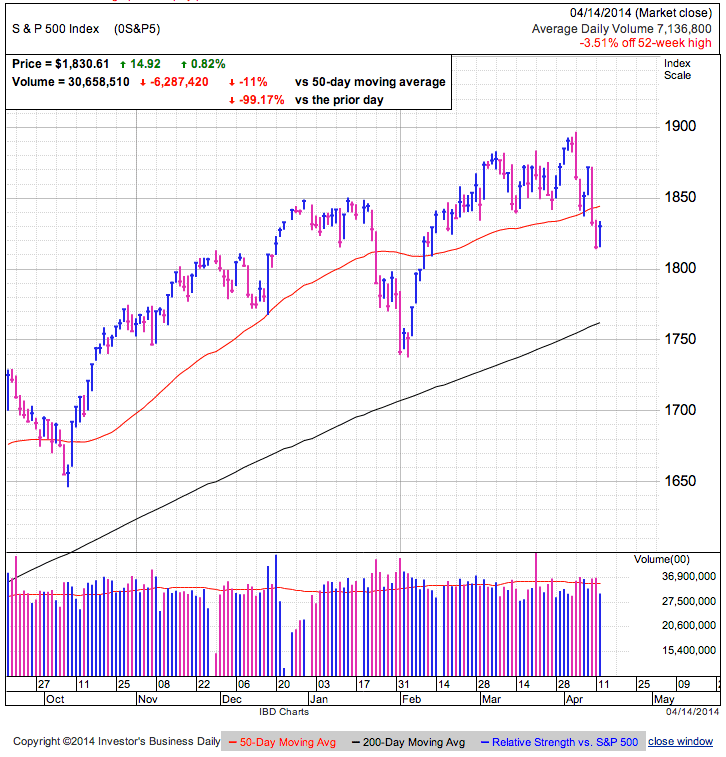 It is too late to buy the dip after six-consecutive up days that recovered 60-plus points. While we still have some upside left in this move, the risk/reward does not favor new positions. At the same time, it is early to short the market and bears should wait for that last surge higher before trading against this strength. For those with long positions, start looking for an exit and either sell proactively or use a trailing stop to protect recent profits. Not a lot happening following the three-day weekend. The market is up 0.3% in late-day trade and continues holding the recent rebound. We remain above the 1,850 support and are 1.5% from all-time highs set a few weeks ago. While the market appears quiet, that speaks volumes since few are fading this bounce. Anyone who doesn’t believe in this market sold or shorted recent weakness, meaning there are few left to sell. Those sellers were replaced by more confident buyers willing to own the volatility and downside risk. The more confident owners are, the less likely they are to sell headlines and dips. This churn in ownership is what set the stage for the bounce from 1,815. Now that dip buyers are sitting on profits and owners who held the weakness are breathing a sigh of relief, the current group of owners is less likely to sell because their decisions to hold this market was reaffirmed. Under most circumstances, confident owners means few sellers and tight supply. Expected Outcome: Pushing toward upper end of trading range. If we close in the green today, that will be the 5th consecutive up-day and we all know even the strongest markets have down-days sprinkled in. Currently we are running into resistance near 1,870, but no doubt many shorts placed their stops just above this level and we will likely see another short-squeeze when we move above this level. From there the next big resistance level is 1,900. But we are slipping into the summer trading session and are more likely to see sideways trade than the next rally leg. If this market stalls at 1,870 and falls under recent 1,815 lows over the next few weeks, then we are on our way to the 200dma. The best profit opportunities come from the seemingly riskiest trades. This is buying when everyone else is selling at a discount and selling when everyone is buying at a premium. While there is a little more upside as we approach the upper end of the trading range, it is far riskier buying the dip on the 5th consecutive up-day. Swing traders are better served looking for opportunities to harvest profits than adding to their positions. Bears should wait for a little more upside before fighting this market. Stalling near 1,900 could be the next good shorting opportunity. Stocks traded quietly ahead of the three-day weekend. 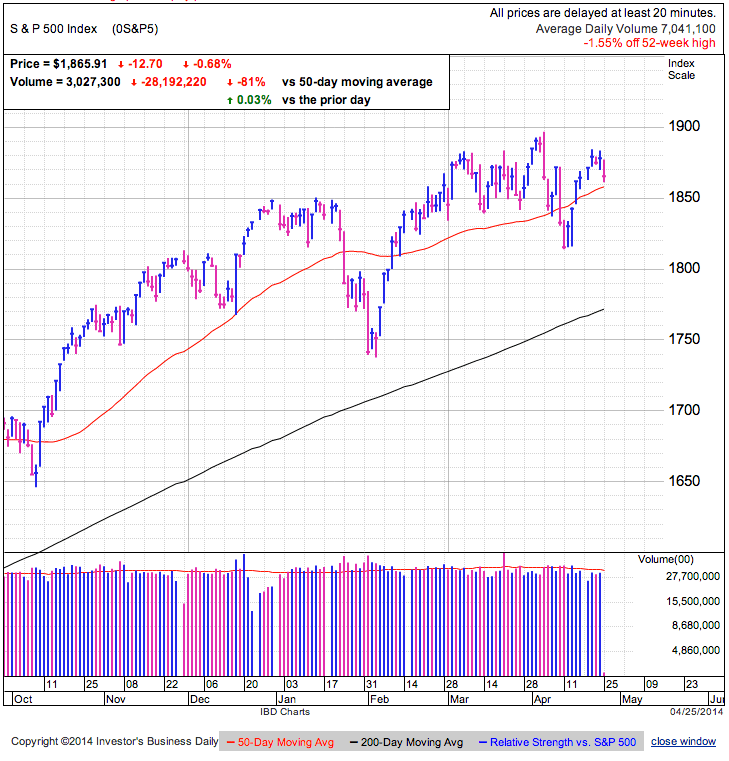 We continue holding recent gains and remain above prior support at 1,850 and the 50dma. This bounce recovered more than half of the recent 80-point sell off and puts the market on more solid footing. The selloff for no reason was met by the rebound for no reason. Big moves are driven by traders changing their outlook on the future due to unexpected headlines. Smaller moves are the result of the natural ebb and flow of supply and demand. The recent selloff was nothing more than a modest pullback when demand dried up near 1,900. While the selloff felt dramatic and spooked many traders, nothing happened over the last couple weeks that changed traders’ economic expectations. Those that expected the economy to continue improving two-weeks ago still feel the same today. We didn’t get fundamental data that made big money managers adjust their economic outlook lower and is why we bounced sooner than many predicted. Last week’s reactionary selling wasn’t due to people thinking the economy was taking a nose dive, but because they thought the market was going to take a nosedive. That a key piece of information technicians miss when they lump all trading activity together in a chart. Supply and demand moves are smaller and more common than fundamentally driven ones. While many were calling for a 10 or 20% correction likes we’ve seen in years past, what these prognosticators forget is those corrections were driven by dramatic headlines that forced traders to adjust their economic outlook. Euro Contagion and the downgrade of US debt threatened the viability of our financial system and is why those headlines lead to big selloffs. Traders were no longer confident about what the future held. This time around we didn’t have gut-wrenching headlines backing up this selling and is why I felt fairly confident this move would bottom while others were predicting we were falling off a cliff. While the chart looked scary, we lacked a fundamental reason to drive confident owners out of the market. While this weakness spooked out impulsive and reactive traders, there was little substance to rattle the nerves of more confident owners. Expected Outcome: There is still more upside left in this rebound, but it is unlikely to lead to a new rally leg. Traders are breathing a sigh of relief as the emotion driven selling abates. We will likely see more buying next week as people feel more comfortable owning this market and they chase the bounce. While this move largely puts fears of a 20% correction behind us, the coast is not clear. 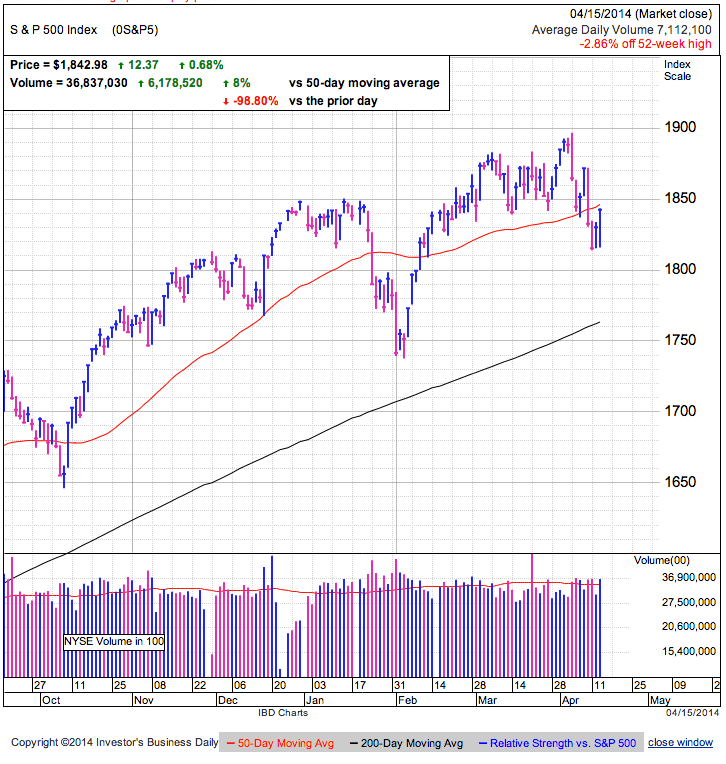 The market will likely remain in a trading range through the summer. Big declines often have multiple false bottoms along the way and this weeks strength could just be a sucker’s rally. It is a little late to buy the dip. The best trading opportunities come from the most uncomfortable situations. Buying after four up-days is hardly uncomfortable. We will likely see a few down days next week that flush out the late dip-buyers and tempt the bears to go short. While I still think there is more upside in this rebound, most of the easy money is behind us and the next couple dozen points of upside will be more bumpy. We broke through the 50dma and 1,850 barrier as this rebound continues. This puts us back above key technical levels and gives this move credibility. Last week many were convinced we were on the verge of a larger correction, but this week we’ve done nothing but go up. And that is how the market works. Everyone who expected a prolong selloff dumped shares reactively, but as soon as they finished selling, supply dried up and we bounced. No matter what the headlines or traders’ expectations, market prices only respond to supply and demand. Even when the crowd is pessimistic, we rally when we run out of sellers. Volatility like we’ve seen over recent weeks churns ownership in the market. The dip forced many weak hands to sell reactively and tempted aggressive bears to go short. While all this aggressive selling continued the move lower, what is going on under the surface is these sellers are transferring ownership to more confident buyers willing to hold the risk and volatility. They confidently buy the discount and patiently wait for the market to bounce. Since they willing stepped into this uncertainty, they are more comfortable holding a declining market. But the paradox is the more willing these new owners are to hold weakness, the less likely it is we will see that weakness. When they confidently hold, then we run out of sellers and the market finds a bottom. Expected Outcome: Look for the bounce to continue into next week. This rebound should continue at least until we recover April 10th’s selloff. From there we will have to see what traders think and how the market responds before we decide if this move continues to all-time highs or stalls out. Last week we saw a painful false bottom that caught many dip-buyers off guard and the same could happen here. Short covering pushed us back above technical support, but we need wider buying for this strength to continue. If demand dries up, we could easily stumble back to the lows. Undercutting 1,810 in coming days means this selloff is going to get a lot worse and the 200dma is in play. It is getting a little late to buy the dip since we are near the middle of a move back to 1,900. The best opportunities arise from the most difficult trades. Buying the third consecutive up-day is late to the party and exposes a trader to greater risks of an intermediate dip. As for bears, it is still early to short the bounce and the next shorting opportunity would be if the market stalls near 1,870. Fascinating day as we traveled well over 60-points intraday. We surged higher at the open, collapsed near recent lows by midday, only to see us race back up to the early highs by the close. Volume was elevated and one of the busiest days we’ve seen this month. We finished a hair under the 50dma and just a few points from prior support near 1,850. Did today’s trade signal a capitulation bottom? It sure felt like it. Early strength pushed us to the 50dma, a technical level that often acts as overhead resistance. Bearish traders used this mark to open the floodgates and their selling sent us down 30-points. But as just quickly as the selling started, it exhausted itself and we rallied 30-points on tight supply. No doubt this whiplash carried most reactive traders out on a stretcher. This volatility is cathartic as it flushed out weak traders and seduced bears to short with both hands. All that selling clearly pressured the market, but the frenzy stalled midday when there was no one left to sell. When we run out of sellers, supply dries up and there is nowhere to go but higher. And this strength is likely to continue given our proximity to the 50dma and 1,850. Modest gains Wednesday could send shorts scrambling for cover and set off a dip-buying frenzy. Expected Outcome: We most likely put in a bottom to this modest selloff. The most profitable trade of 2014 has been buying weakness and selling strength. It appears this is no different. The best time to buy is when everyone fears we will continue lower. Anyone expecting lower prices already sold and they were replaced by confident dip-buyers willing to own the risk. Purging weak-hands and infusing strong-hands is the best way to turn this market around. Every dip is buyable until the one that isn’t. While I still believe we need a headline event to dramatically lower investor’s expectations of future profits and earnings, sometimes fear is all it takes to turn confident owners into panicked sellers. Even as this volatility flushed many weak holders, without a doubt we could easily see another leg lower before this is all done. The best trades are often the hardest to make. Buying recent weakness was not easy and will likely turn out to be the right trade. Shorts should consider locking in profits, or at the very least protect themselves with a trailing stop. Dip-buyers should get ready to ride the short-squeeze higher. Since we are in the middle of a holiday shortened week, we should expect continued volatility due to lighter than normal volume. Stocks closed higher and recovered most of Friday’s losses, but it was a wild ride getting there. After an opening gap higher, the market slipped to break even before staging a late-day rally back to the early highs. 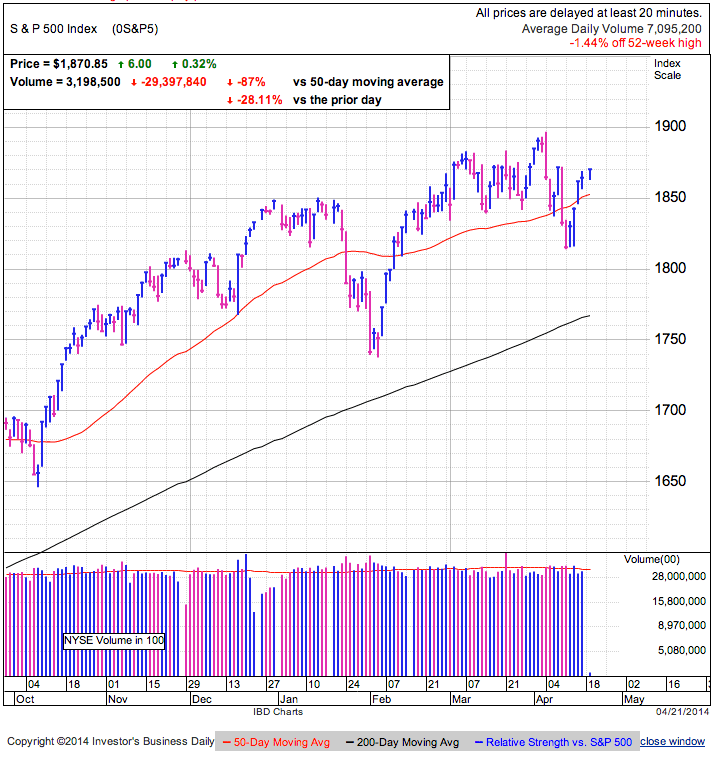 Volume was well under average on the first day of this holiday-shortened week and the S&P500 remains under the widely followed 50dma. Sometimes markets are overwhelmed by surges in supply and demand, other times they move because no one is buying or selling. Today’s low-volume rally had selling take a break as we floated higher on tight supply. This strength took pressure off nervous owners, but it didn’t do much to tempt reluctant dip-buyers that were burned by last week’s false bottom. While there were few buyers, there were even fewer sellers and is why we ended the day higher. With the S&P500 down over 4% and the NASDAQ 8%, many are claiming this is the 10% correction that is long overdue. These people point to similar corrections in years past, but to me there isn’t much similarity because the examples they hold up were driven by some fundamental change that altered investor’s outlook on the future. Euro Contagion and the downgrade of US debt were the two biggest selloffs of this 5-year old bull. While the technical setup might be similar, we still lack the fundamental catalyst that changes confident investors outlook on the future. Without those fear mongering headlines, this dip will likely be little more than the normal back-and-forth. Expected Outcome: Without a fundamental reason to sell off, we will remain range bound. While I don’t see any reason for the market to implode here, there also isn’t much reason for it to race off to the moon either. We trade sideways more often than directionally, so why are so many people taking sides, predicting a launch higher or collapse lower? Why can’t we simply hang out in a 100-point trading range through summer? Sometimes we don’t know why markets selloff until after the damage is done. Maybe there are people far smarter and connected than we are and they are liquidating positions ahead of the imminent market collapse. While it is fun to predict market collapses, smart money bets on a continuation of the previous trend. That’s because a trend will continue countless times, but only reverses once. It’s a numbers game. While it is hard to get excited about the upside, the market is in a better position to bounce than continue lower.